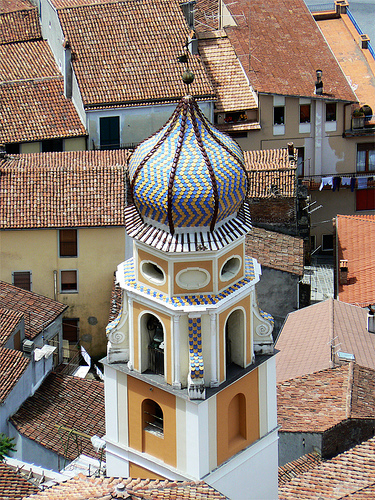 The region of Basilicata was known in Roman times as Lucania – a name some residents still use today. 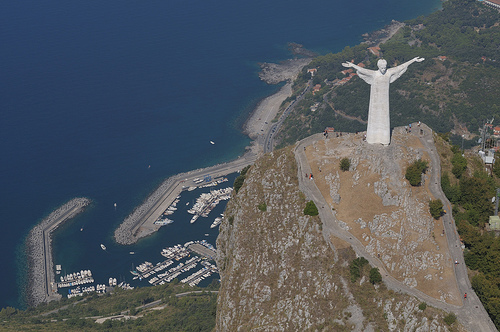 Basilicata is in southern Italy and sits between the boot’s ‘toe and heel’, with Puglia to its north, the Ionian Sea to the south-east, Calabria to the south and southern Campania to the west. 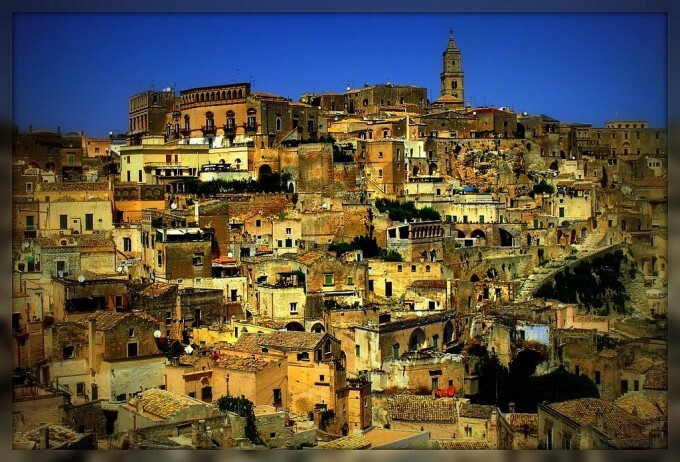 Basilicata may be a small region, but its landscape is diverse, ranging from the eroded hills called ‘Calanchi‘ in the Matera area (where the Sassi, ancient cave dwellings, are a World Heritage Site), to the higher mountains of the interior and the coastal beaches. 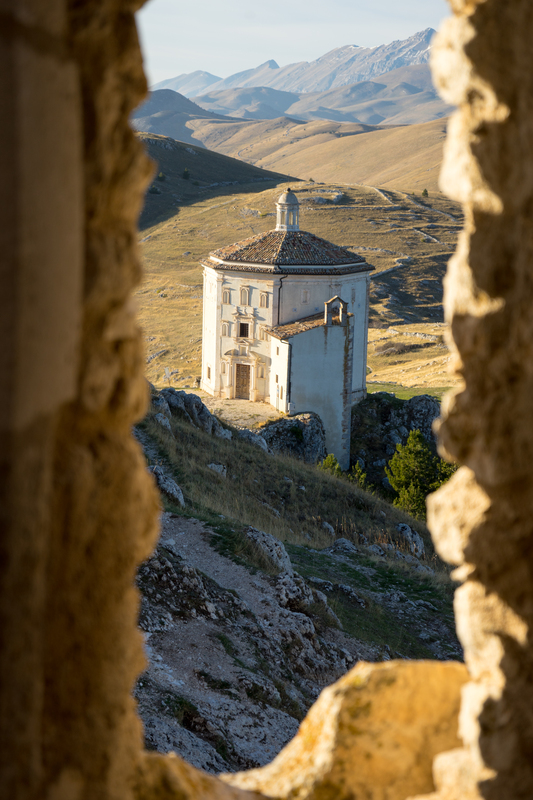 Basilicata may be sandwiched between the two principal regions of mainland southern Italy – Calabria and Puglia, but it has retained its own cultural identity. 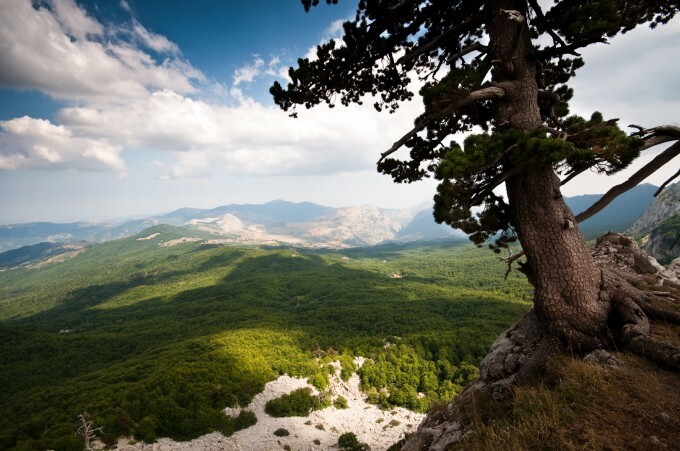 Summers are very hot here, but the National Park of the Pollino, located in the central mountainous area, is popular with tourists wanting a respite from the heat. 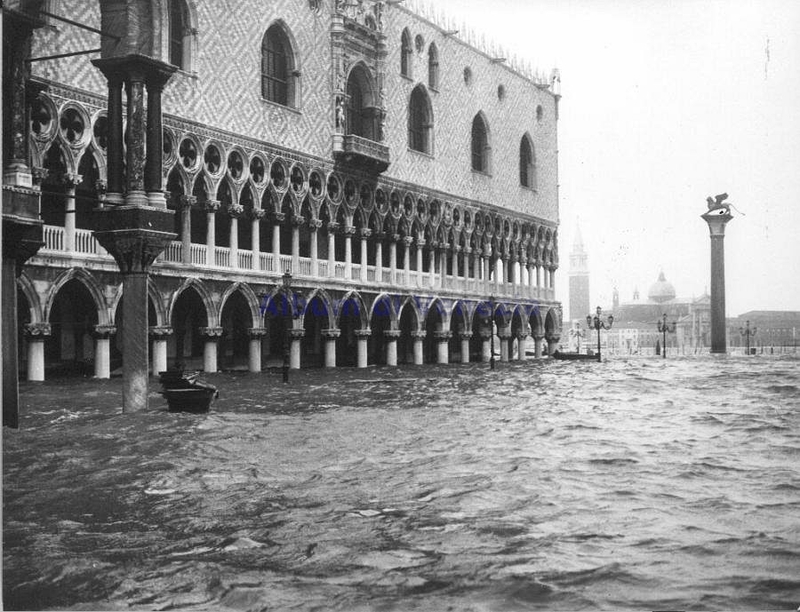 Medieval castles, including those built by Federico II, are important cultural monuments. The region remains rural and agricultural, with excellent cheeses due to large areas of pasture that are still used to graze sheep, goats and the pale cattle of southern Italy, of the Podolica breed. Pork products are popular too, with special salumi being made here. As for wine, the northern area of Basilicata is famous for its Aglianico del Vulture DOCG, made from the south’s most important and historic red grape, Aglianico. Other reds are made in the area near Moliterno, in the region’s west. 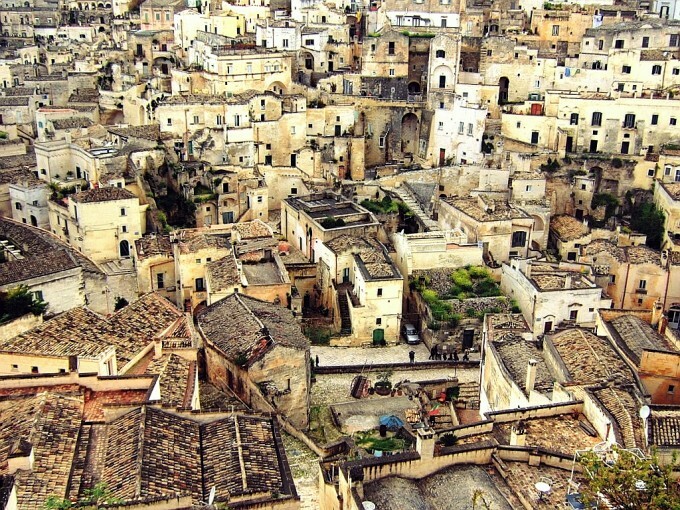 Matera is located in an area with many gorges and is famous for its so-called ‘Sassi’ in the lower town. ‘l Sassi’ (sassi means ‘stones’ in Italian) are rock dwellings which also contain 130 churches built into the rock dating back to the 8th century BC. Potenza is the region’s capital city. 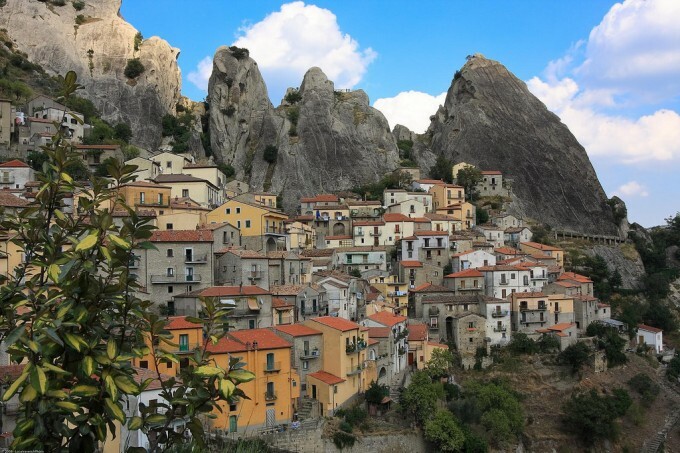 Scenic sights include: Castelmezzano (a stunning cliff-side village built within stone peaks which is known for sausages), the Volo dell’Angello (a zip-wire through the rocks from Castelmezzano to Pietrapertosa, Pietrapertosa (another cliff-side village with an Arab quarter in the heart of the village), and Venosa (an ancient small town with an archaeological park at the northeastern edge), which was the birthplace of the Latin poet Horatio and, with Vulture, is now the centre of the winemaking area. 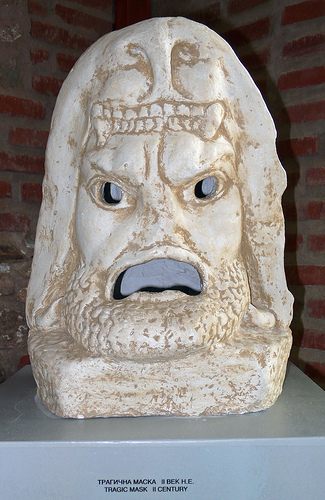 Metaponto and Heraclea are archeological sites with Greek remains. 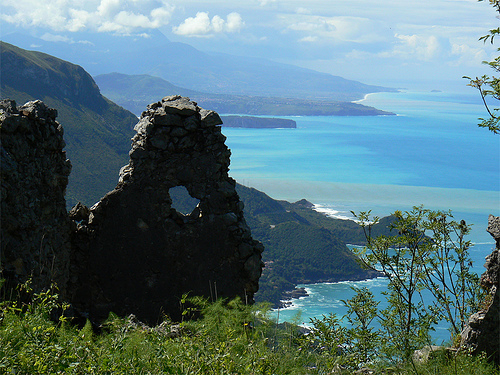 Maratea is known for its seaside position. 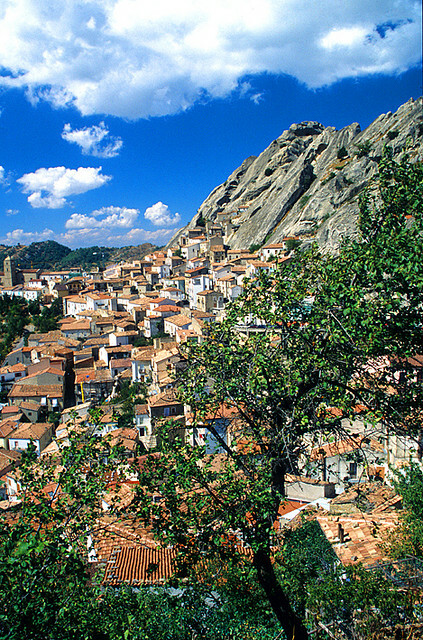 Basilicata is known for its cheeses, spicy food, lamb, pork, tomatoes, and wild herbs. 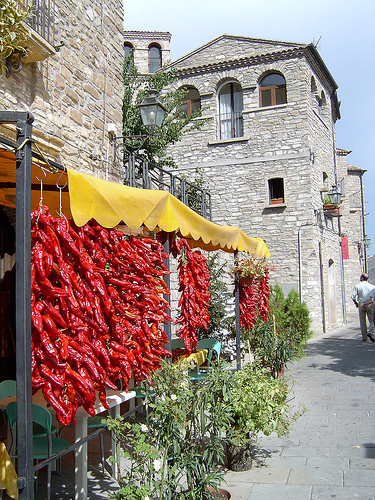 More chillies are eaten in Basilicata per person than anywhere else in Italy – except parts of nearby Calabria. The most common varieties of chilli (called peperoncino in Italian) are Diavolicchi and Sigarette. In Basilicata, as throughout the south of Italy, most people hang strings of dried chillies in their kitchens so they’re always readily available. Extra virgin olive oil is used for cooking; butter rarely appears here. 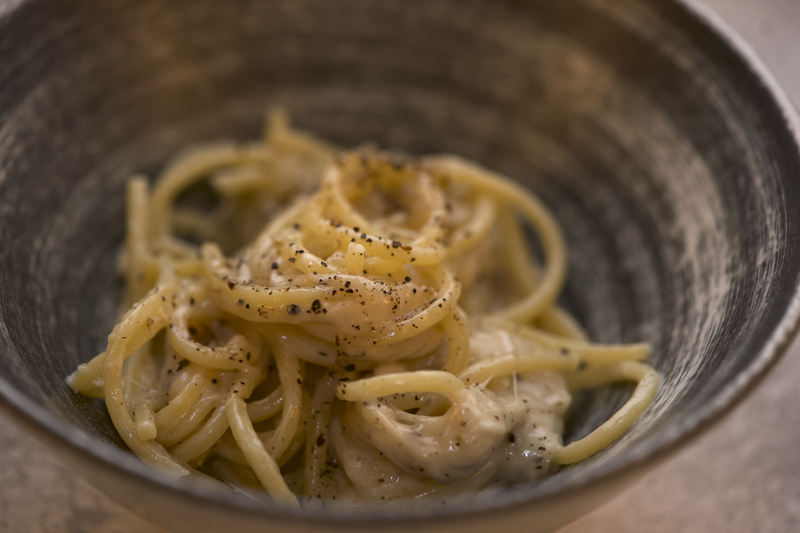 The traditional dishes of Basilicata are based on rural simplicity. 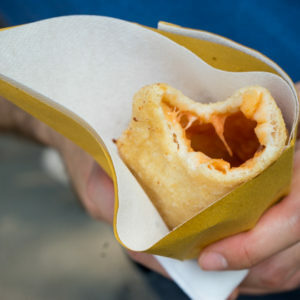 Bread and pasta are popular; simple pastas are handmade in many imaginative shapes of just flour and water, without egg. Typical pasta shapes include strascinati (made with the indentations of two or three fingers), tagliolini (long thin noodles), triid (long pasta strips rolled by hand), orecchiette (little thumbprints of pasta shaped like ‘ears’), tapparelle (large orecchiette), lagane (tagliatelle), and ferrettini or fusilli (pasta strips rolled around a thin metal rod). Vegetables are often prepared in place of meat in Basilicata. Characteristic vegetables are aubergine (including a red variety), artichokes, tomatoes, broccoli rabe, carrots, turnip tops, potatoes, onions, lampascioni (wild grape hyacinth bulbs), peppers, chicory, mushrooms, and broad beans. Legumes such as chickpeas, lentils and beans are also grown locally and feature in the recipes of most households. 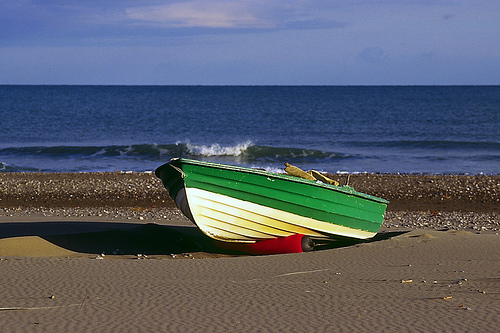 Fresh fish is readily available in coastal areas but inland meat dishes are more popular, of lamb, pork, goat, or beef. There is still a strong tradition of shepherding in this region, on the slopes and pastures of the mountains. Young lamb is a delicacy and was historically considered to be a remedy. Today it is served for Christmas and Easter family meals. At Christmas, even poor families still feast on as many as 13 different dishes. Pigs are raised by families and spit-roasted during festivities or made into salumi, which may be piccante (from the added chillies) or not. Sausages are sometimes also preserved in rendered pork fat. Local pork products include: ventresca di Rionero, pancetta, lardo, prosciutto, the famous lucanica sausage praised even in Roman times, pezzenta (seasoned head meat), sopressata (made here from offal), vecciareddra (lungs, skin, and cartilage sausage), and cotechinata. Basilicata’s cheeses are famous thoughout Italy, especially the exceptional caciocavallo Podolico, which is formed in the shape of a giant teardrop. 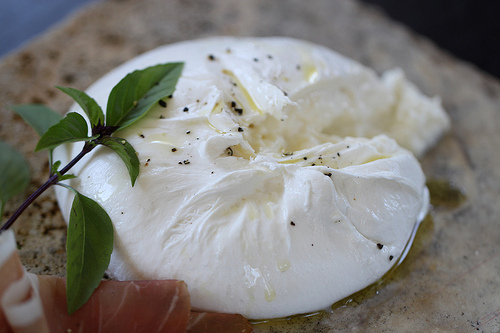 Provolone, scamorza, burrata or butirro, mozzarella and caciota are other cow’s milk cheeses from the region. Sheep and goat’s milk cheeses are also popular including the Pecorino di Filiano, Canestrato di Moliterno, and the salted cacioricotta. Other local ingredients include: prickly pears, figs, capers, and honey; patelle (limpet, a type of mollusc), anchovies, truffles, liquorice, durum wheat, and many cultivated fruits: strawberries, raspberries, peaches, pears, grapes, asparagus, oranges, tangerines, clementines, grapefruits, and nuts (almonds, hazelnuts, and chestnuts). 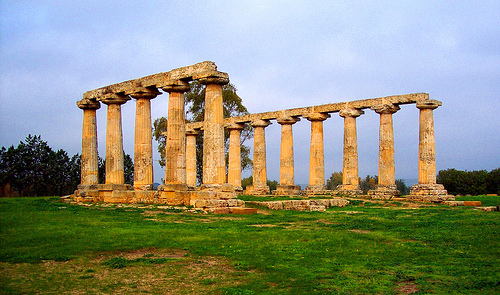 Basilicata produces fine extra virgin olive oil in several parts of the region. Some olives are salt-cured for table eating. 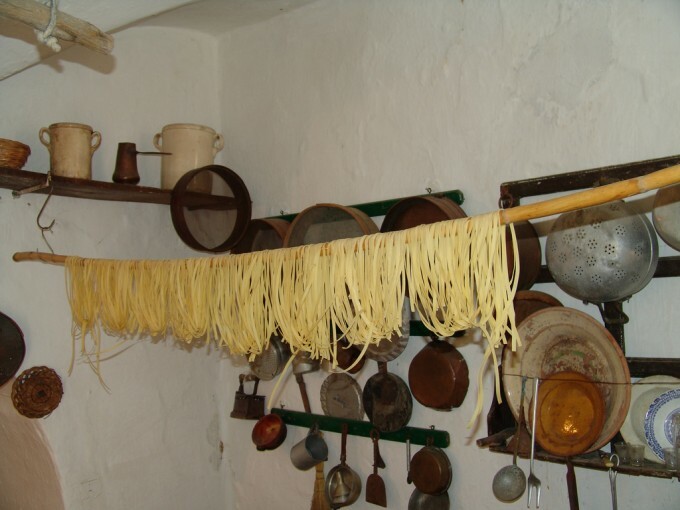 The typical dishes of Basilicata include pasta dressed in tomato sauce, herbs and chilli, or pecorino cheese and olive oil. Meat, when cooked, is usually grilled, braised, or baked. Vegetables often feature instead of meat in elaborate dishes such as melanzane al forno (aubergine cooked with olives, anchovies, capers, and tomatoes), ragnante (potatoes cooked with onions, tomatoes, pecorino, and olive oil), and piatto d’erbe (a mix of many vegetables like onions, aubergine, peppers, tomatoes, parsley, basil, and garlic cooked together). Meals often end with cheese, followed by nuts and oranges. 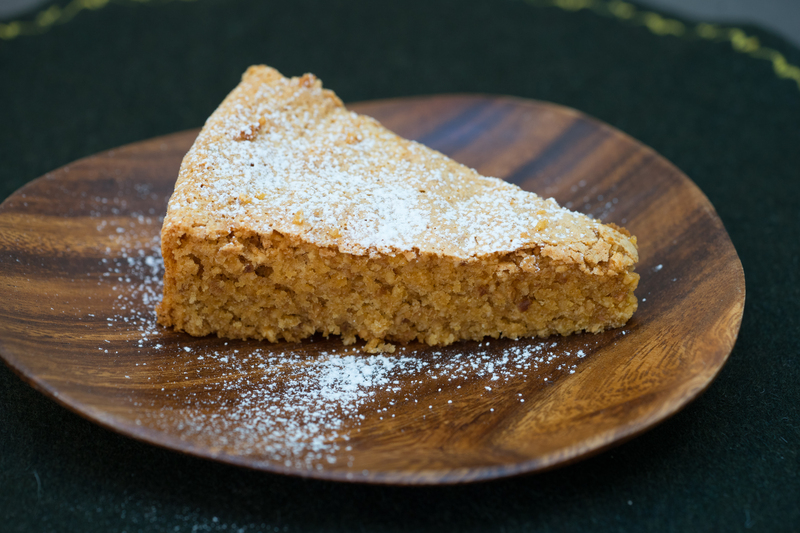 Desserts are sweet; some include honey. A local gem is red wine made from Aglianico grapes in Aglianico del Vulture DOC. 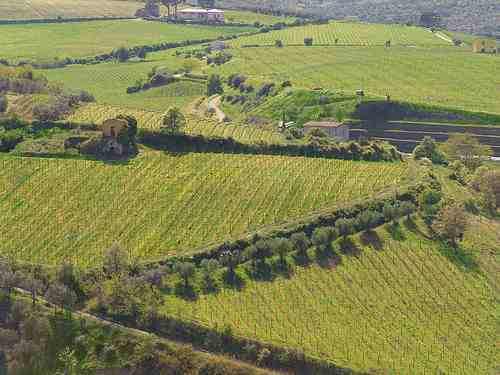 Look for producers such as Carbone, D’Angelo, Paternoster, Tenuta Le Querce, Terre degli Svevi, and Vigne Mastrodomenico. Basilicata is famous for its Amaro Lucano, a bitter after-dinner liqueur made from alcohol infused with wild and medicinal herbs.